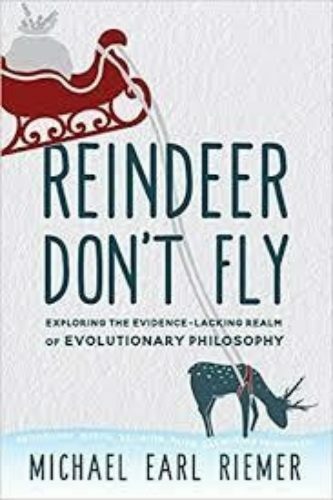 The subtitle of this book pretty much says it all: Exploring the Evidence-Lacking Realm of Evolutionary Philosophy. In 400-plus pages, Mr. Riemer carries out this mission with notable gusto, exposing “evolution,” or Darwinism, as not only a house of cards, but in every way a false religion, too. In 1 Kings 18, Elijah challenged the prophets of Baal to demonstrate the power of their god. As their demonstration grew more and more futile, and ridiculous, “Elijah mocked them, and said, Cry aloud: for he is a god; either he is talking, or he is pursuing, or he is in a journey, or peradventure he sleepeth, and must be wakened” (v. 27). And after the true God displayed His power, the false god’s prophets were killed. We can’t think of anyone who was ever mocked into the arms of Jesus Christ. Elijah’s mission was to destroy the worship of Baal in Israel. But Jesus had another mission: “For the Son of man is come to save that which was lost” (Matt. 18:11). Mr. Riemer is trying to destroy another false religion—secular humanism in general, and belief in evolution is particular. Ridicule is one of his tools. I grew up in a time when the truth of evolution was taken for granted. No one, but no one, ever questioned it. I never heard it questioned until I’d finished college and was an adult. My first reaction of “creationism” was incredulity. What—there were actually people who didn’t believe in evolution? Were they crazy, or just spectacularly ignorant? How could they even say such things with a straight face? Believers in evolution, on the other hand, were the smart ones, the ones who knew the truth. They had Science on their side, and Science is always right. Only a fool would go against Science. How naïve I was! How ignorant. But I really couldn’t help it, at the time. I’d been spoon-fed evolution all my life. None of the adults in my family ever questioned it. They thought I was smart, knowing so much about dinosaurs. Certainly none of my teachers in the public schools ever expressed the slightest doubt of evolution. They never even got around to teaching it—because everybody knew about it, and knew that it was true. It literally went without saying. None of my teachers in Sunday school, or church, or confirmation classes, ever raised the subject. Looking back on that, it puzzles me. We were taught that God created everything in seven days. It occurred to no one to ask how that squared with the millions of years allotted for evolution to transform single-celled amoebas into fish, reptiles, dinosaurs, monkeys, and man. That creation story—or rather, non-creation story—is considerably at odds with the one we read in Genesis! But no one ever said a word against it. What the author confronts here is a proud tower of “settled science,” and its greatest strength lies in the smug self-assurance of its tenants that they are far more intelligent than “religious people” can ever hope to be. And its second-greatest strength is mass, unquestioning acceptance of these Science people’s intellectual superiority. But what if the whole proud edifice were shown to be unscientific, unsupported by the facts, dishonest, just plain wrong—and ridiculous? What if its tenants turned out not to be smarter than the rest of us, after all? It’s the emperor’s new clothes. I believe Riemer has indeed shown that evolutionism is not science, not based on any scientific method employing observation of real things in nature, or any kind of testability; that its presuppositions are either purely imaginary or else opposed to what we now believe to be true about DNA, genetics, and other aspects of biological science; that its proponents have been caught cheating numerous times; that they have fallen for numerous hoaxes; that they were institutionally invested in discreditable political philosophies, like socialism and communism, and prone to aiding and abetting tyrants, who have found evolutionism most compatible with their lust for power and their means of keeping it; and, finally, beneath it all lurks a virulent strain of atheism, and hatred of both God and man. Other than that, it’s fine. We are told by these smart people that once upon a time it rained on the rocks, or something happened to the rocks, and the rocks came alive (one is tempted to sing, “Doo-dah, doo-dah”). It must be true because they say it is—despite innumerable failed attempts in the laboratory to make non-living material live. And then, over billions of years, these rudimentary life forms grew more and more complex, and bigger—by means of evolution—until they bore no resemblance at all to the original. It’s already getting too silly for words. How did life start, again? “Simply put,” writes Mr. Riemer, “prebiotic chemistry [the stuff that somehow came alive] is a way to determine how processes that never happened, under conditions which never existed, during a time that never was, made it possible to create an organism that never lived, using a synthesis of materials brought into being by nothing” (p. 193). The “nothing” is the Big Bang, another one of those cosmic events that “must have happened,” although no one was around to observe it. “But our equations and computer models say it had to happen!” But what does nature say? On that subject, nature is mute. And by what means does one species “evolve” into another? How do we get, say, birds from dinosaurs? Darwin thought it was by natural selection over billions of years. Without being entirely discarded, this had to be moved over on the shelf to make space for neo-Darwinism, featuring endless strings of favorable mutations. And now? So what makes “large-scale genetic changes” happen? DNA, which provides the genetic blueprint for every living thing, doesn’t work that way. DNA is ultra-conservative: what is in the DNA is what you get. You may get less information, if somehow an organism is genetically damaged—but you never get more. Nor can an organism’s descendants ever inherit characteristics acquired during the parent organism’s lifetime. In fact, DNA tends to prevent qualitative change. Fish do not beget amphibians. And so the evolution crowd has to rely on “beneficial mutations,” which in the real world are vanishingly rare. That’s why it takes tens of millions of years to collect ‘em. But Mr. Riemer devotes much space and labor to the argument; and if you want to examine a thorough treatment of it, read the book. Suffice it to say that no proposed means of “qualitative change” has ever been observed in nature or duplicated in the laboratory, or by farmers, animal breeders, or anyone else. The whole thing is a fairy tale, cloaked in scientific jargon and propped up by prejudice and politics—and an establishment that has been known to panic when the questions get too hot. Mr. Riemer is committed to the Bible as the true and reliable source of history and science. He consults scientists who are also Christians and creationists. He and they both admit that much of what they do is to speculate on the history recorded by the Bible: and there is no way to test or duplicate history. This leads them, for instance, to speculate on the actual mechanics of Noah’s Flood. Where did all the water come from, and where did it go? Did it involve the rise of mountain ranges, and the bending and folding of rock layers which, we can see today, cannot be bended or folded without being shattered? What role might have been played by earthquakes and volcanoes? Where did the thousands of feet of sedimentary rock layers come from? In Chapter 13, “The Ground Beneath Us,” Riemer sets up a picture of the antediluvian world, and from there moves on to analyze its destruction by the Flood. Starting on Page 323 with “Drowned from Beneath—the Hydroplate Theory,” he treats us to a description of what the Flood might actually have been like—and trust me, this section is not for the faint-hearted. The creation scientists who have tried to account for the existing geology of our world in light of what the Bible tells us about the Flood paint a hair-raising picture of a total planetary catastrophe. Riemer here comes into his own as a descriptive writer; and you won’t easily forget those descriptions. The book has its faults—the absence of an index, a long digression on the benefits of hemp and the total harmlessness of marijuana: had I been the editor, I would never have permitted that. Here and there are bits of information that couldn’t be tracked down for confirmation, although mostly he does provide adequate citations where it’s needed. But in his primary mission, to puncture the swollen bubble of evolutionism, this proving there was never anything in it but hot air, Mr. Riemer brilliantly succeeds. If I were not a Christian, and had never read the Bible, I would still find his critique of evolutionism thoroughly devastating. And that, I’d say, is a good start.